Those with a ** next to their name gave an additional donation. Those with *** have given a $25 or greater donation. Thanks to all those who have joined or renewed their commitment and those who have given additional donations to support our many causes.Get on board now for all the benefits, including discounts at all the bike shops. If you haven’t already renewed for calendar year 2016, your membership has expired. Please see the application form at the end of the newsletter. The next regular meeting will be held at 6:00 p.m., Monday, July 18th, at Chapala’s Café at 2nd and C Streets in Eureka. Dinner is optional. Agenda items may be suggested by emailing info@humbike.org. We have proclaimed Bike Month Humboldt 2016 an unqualified success. Many events were held, attended by scores of cyclists, including our signature Bike to Work Day rallies in Eureka and Arcata and the well-attended Humboldt Bike Shorts. Mellody Mallick wins a prize for her “Best Commuter Bike,” as selected by audience applause. See our humbike.org website for many other photos from Bike Month events. Humboldt Bike Challenge a Big Hit! This year, 102 Humboldt locals took the Humboldt Bike Challenge, inaugurating Humboldt’s entry in the nationwide challenge. The Humboldt Bike Challenge’s goal was to collectively ride 5,000 miles in May, for Bike Month. Only half of Humboldt’s Challengers logged their miles, and they still obliterated the challenge goal! They pedaled over 9,000 miles in one month. According to the National Bike Challenge database, the Humboldt Bike Challenge burned nearly 440,000 calories, saved $7,900 in personal transportation costs (worth 4,100 bus rides on HTA, or 1/3 the price of a new Chevy Volt electric vehicle); and kept 4,950 pounds of CO2 out of the atmosphere, equivalent to how much CO2 250 gallons of gasoline would emit from automobile use. Most intrepid of all, nine fearless (what’s scarier than asking friends for money?) Challengers joined the Bay Trail Team to raise funds for the Humboldt Bay Trail. The Bay Trail Team raised $1,515.31 that will go toward building and maintaining the future gem and backbone of the regional bicycle network. The Bay Trail Team winner for most funds raised is Greg Jaso, who pedaled 250 miles and pan-handled pledges for $450. Over 200 miles: Rick Knapp, Greg Jaso, Sandy Earl, and Mark Mueller. 151 to 200 miles: Sandra Rosa, Will Bagnall, and Gaela Mitchell. 100 to 150 miles: Eric Lund, Oona Smith, and Emily Sinkhorn. For total distance, transport and recreation miles combined, first place goes to Sandy Earl who rode 896 miles. Claudio Freixas Jr. rode to second place (591 miles); Frank Demling rode to third place (584 miles). 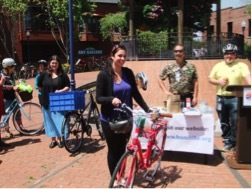 Kudos and thanks to the bike-to-workers who entered their workplaces in the Humboldt Bike Challenge: Caltrans District 1, Humboldt County Department of Health & Human Services, Mad River Community Hospital, Manhard Consulting, Ltd., and Redwood Coast Energy Authority. Props and praise to the bike-to-schoolers who did the same for Arcata High School and Eureka High School. By letter dated April 6, 2016, the HBBCA sent a letter to the California Coastal Commission supporting the County’s proposal to construct a minimum 10-foot wide paved trail when ultimately constructed. The Coastal Commission has been urging a narrower trail in order to reduce impact on wetlands. The HBBCA emphasized safety and the short-sidedness of constructing a trail any narrower given the expected demand from bike commuters and recreational users of all types. With the lack of such facilities in Humboldt County, this trail is expected to be very popular on Day 1 and will continue to grow in use over the next 20 years. What’s going on in McKinleyville on Central Avenue? That’s what Rick asked me when he stopped by on his bike the other day while I was doing yard work. Well, long story short… It started out as a Highway Safety improvement Program (HSIP) project that intended to reduce vehicle collisions by limiting left turns in and out of the numerous driveways along Central Avenue by constructing a continuous raised center median, with left turn pockets at street intersections. Medians (and pedestrian crossing islands), are 1 of the 9 proven safety countermeasures cited by FHWA that reduce collisions. However, business owners and other community members were not happy about the lack of convenience by limiting left turns. The County of Humboldt went back to the drawing board, engaged the public, and after numerous iterations and public meetings, unveiled the final plan, backed by the community, to add green colored bike lanes, pedestrian crossing islands, enhanced thermoplastic traffic stripes, radar feedback signs, and equipment on traffic signals that allow emergency vehicles to change the signals remotely. Notice the pedestrian crossing islands are still in the plan (1 of the 9 proven safety countermeasures!). Construction is estimated to be completed by?????. I wanted to thank you for all of your advice. I finally remembered to send in the registration form with membership fee. A co-worker reminded me because she knows I ride and wanted to tell me about this group. I have pretty much taken all of your advice. I put day panniers and a road rack on, waterproof of course. I also learned the hard way to have full rain gear and fenders (the hail is brutal). I have been mostly using 101 to commute because it is flat and direct, and seemingly the safest route. I have found that Old Arcata highway and 255 have a lot of drifters, random lose animals, and speeders. I do take those routes in the afternoon however, as the scenery is amazing. Coming from Chico, where most people are cyclists, this has been quite a transition. I see a few other commuters or cyclists here and there, but it does not seem as much like the thing to do around here. I am very thankful that you said you rode in any weather here. I am used to being the bike weirdo everywhere, but every new place is different. With your membership card, you may request the following discounts on bike parts and accessories: 10% at Revolution Bicycle Repair; 15% at Adventure’s Edge; 10% at Pacific Outfitters, and 15% at Sport and Cycle. Membership cards include stickers on the back showing discounts offered by the various bike shops.